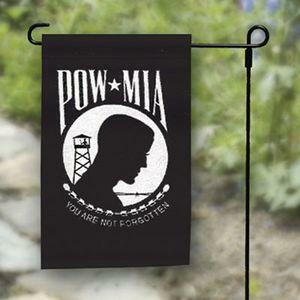 POW/MIA Garden Flag - Single Reverse - 12x18"
High quality outdoor nylon POW/MIA Garden flags. Our MIA/POW garden flag is fully dyed for great outdoor performance. This flag is SINGLE SIDED with the reversed image on the back. POW/MIA banners are finished with a pole sleeve top to fit most garden style poles. All our POW/MIA Garden Flags are proudly made in the USA.